Today ONLY (8/8), Save on Maddie Rae's Slime Products $7.99 - $18.99. 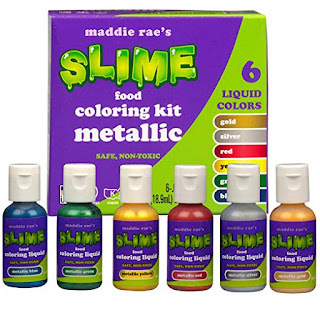 For example this Maddie Rae's Food Coloring Kit - 6 METALLIC Color Variety Kit - Safe, Food Grade Non Toxic Formula for all Slime Making is $11.99. •Maddie Rae's Slime METALLIC Food Coloring Kit - NON Toxic, Food Grade - Make Slime more Awesome with Slime Coloring! •Will not separate or weep and won't harden- perfect for all Slime! •All the Maddie Rae's Slime Colors are made in the USA with high quality FDA approved ingredients, Non Toxic, Food Grade, and are Certified Kosher.